If you’re shopping around for the best photo booth rental for your annual corporate event, don’t settle for just any type of kiosk. One of the prime advantages of digital photo booths is that virtually everything can be customized, immersing attendees in well-rounded experiences involving your brand. This often comprises of logo placement on pictures, but it shouldn’t stop there. Ask about custom skins for the kiosk itself to showcase your brand’s look and feel, as well as personalizing any emails going out to attendees to let your brand’s voice be heard. There’s power in photo marketing, and renting a photo booth is one of the easiest ways to leverage it. What’s the point in branding photos with your logo if they can’t be shared organically on social media? Social media is important to your event, whether it is a corporate or social one, so opt for a photo booth rental that allows your guests to instantly share their pictures online. Be sure to ask the vendor if pictures can also be shared instantly to an album on your Facebook page (personal or business), or if they can be tweeted out. Social media’s best friend is the hashtag, so look into a photo booth that includes your event hashtag in every tweet or picture uploaded to your Facebook album. If it’s your first time creating one, read on for 5 tips on how to create a hashtag for an event! A part of your research should include comparing photo booth companies based on the quality of their equipment. As a rule-of-thumb, quality always trumps all. Look for a photo booth that comes equipped with a professional camera that takes high-definition shots. Aside from the camera, ensure that prints are lab-quality. With lower quality prints, you run the risk of smudging, gradual fading, or lack of clarity. Remember, photos are great keepsakes from events, so ensure they last a lifetime! If you’re opting for a custom kiosk-skin to further personalize the kiosk, ensure this is of top-notch quality as well. You want it to be durable, with no bubbling or transparency issues. A reputable company ensures that everything is executed with the utmost attention-to-detail. Quick tip: An open-air photo booth is a great option for easy accessibility for those attendees with disabilities! When renting a photo booth, remember that its main purpose is to entertain your guests. Look for a kiosk that’s interactive and playful. Physical props are a must, but digital props, green screen backgrounds, and drawing tools let your guest have more fun by allowing them personalize their photos. Consider a GIF booth as well for an extra dose of entertainment. Most companies have separate kiosks for GIFs and photos, in which case you may have to choose between the two. However, our kiosk takes photos or gets your guests moving with our Animated GIFs feature! One of the most important factors you should consider when renting a photo booth is the quality of customer service that comes with it. Think about what your preferences are in terms of a stand-alone photo booth, or one that comes with an attendant. There are many great advantages to having an attendant present at your event. For one, if any technical difficulties arise, the attendant is there to resolve them with no extra stress for you. Attendants are also great facilitators, and help keep lines moving—keeping everyone happy. Best of all, they can keep kids entertained (read: excellent babysitters!) while the adults mix and mingle. Whether you’re renting a photo booth for photo marketing purposes, or simply for a custom experience for a social event, look for a vendor who will consult with you and provide guidance. After all, they are the experts! Quick tip: Opt for a photo booth rental that compliments your event, instead of being in the way. Look for a kiosk that’s sleek and occupies minimal space. 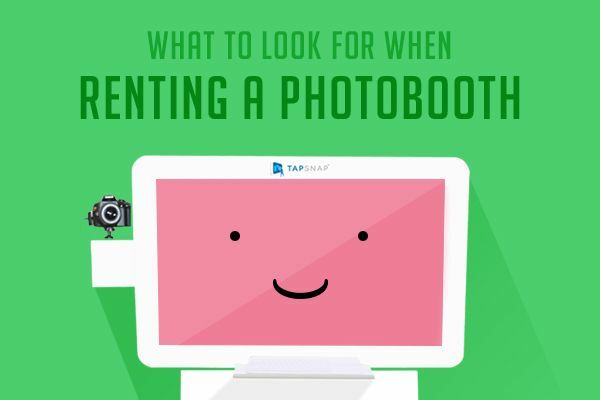 Remember, before renting a photo booth, weigh in all your requirements, and do your research! At TapSnap, we offer custom solutions to make every event unique. Whether you’re a bride in search of a wedding photo booth, or an event marketer looking to take advantage of photo marketing, give us a call at 1-800-600-8710 to see what we can do for you!